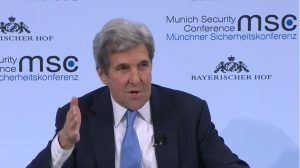 John Kerry spoke on a panel about the “Widening Gulf” at the Munich Security Conference on February 18, 2018. What follows is a transcript of his remarks relevant to the Iran nuclear agreement with the corresponding timestamps. To watch the full video, click on the image below. I want to speak particularly to what the Prime Minister of Israel raised here, which is obviously the Iran agreement. I am a great friend of Israel. I had a 100% voting record over 28 years in the United States Senate. And I fully respect and accept the responsibility of the Prime Minister of Israel to defend his country and to take every step necessary to protect it in the long term. But I think that where we differ – and we became good friends, in many, many, many hours of conversation. We have a difference of view. Today he said to you that in ten years Iran will be on its way to having a nuclear arsenal. That is just not accurate. It is fundamentally not accurate with respect to this agreement. So I want all of you, I want this Munich Security Conference, in this moment, to measure fully the reality of this agreement. I do believe Iran presents threats. We kept the missile components of the agreement. The Russians and Iranians and Chinese wanted zero years of continued restraint on missiles. So we didn’t concede anything. We actually won a victory of getting eight years. We wanted ten. It would be wonderful to have a longer period but we recognized that the agreement we were making was not to deal with all the other issues, which we all honored and said are there. Human rights. Missiles. Arms shipments. Involvement with Hezbollah. Iraq. Yemen. These are all very legitimate issues. But what we decided, not as a concession, but as a matter of strategic thinking, was based on the Bush administration’s experience for all of its prior years where they were seeking a “no enrichment” policy. It went nowhere. It did nothing. Meanwhile, I ask every single one of you here to focus on where we were in September of 2013, when I became the first Secretary of State to sit down with an Iranian Foreign Minister in 35 to 40 years. I ask you also to think about this. If your house is on fire, are you going to refuse to put it out because you’re concerned that it might light on fire again in 15 years? Or are you going to put it out and use the intervening time to do the best you can to prevent it from ever catching fire again? That is the way we approached this agreement. Why? I’ll tell you why. The day I sat down with Foreign Minister Zarif, in September in New York, that day Iran had 12,000 kilograms of enriched uranium. That day, Iran was a couple months away from commissioning the Arak plutonium reactor, which could have produced enough plutonium, weapons grade, for two bombs a year. That day, they had 27,000 centrifuges deployed, 19,000 of which were spinning and enriching. And they were enriching at high percentages. And our intelligence community, and the intelligence communities of five other countries, all said that Iran is about two months away from breaking out into a full-on nuclear program. The day I sat down with Foreign Minister Zarif in September 2013, for the first conversation in forty years, Iran had already mastered the nuclear fuel cycle. And bombing was not about to put that genie back into the bottle. I can’t tell you how much we were resisting the Israeli Prime Minister himself. King Abdullah of Saudi Arabia, who said it to me personally. President Mubarak, who said it to me personally. And I guarantee you, if this deal goes away, you know the pressures you’re going to hear coming from certain quarters. So, what did we put in place? When Bush started his conversations with Iran, they had 164 centrifuges. That went up to the 27,000 I described, 19,000 of which were spinning. Today we have 130 additional inspectors on the ground in Iran, inspecting radio-transmitted, sealed centrifuges and facilities on a daily basis. Today they are limited to a 300 kilogram stockpile for 15 years. Which is why I hear “nuclear arsenal in 15 years” – it is physically impossible to make a bomb with 300 kilograms of enriched uranium. And we know every day that’s what they’re limited to. We also limited them to 3.67% enrichment. We limited them. And by the way, the notion that you can’t inspect military facilities is absolutely wrong. We have an inspections system in place where over 24 days with a vote that would automatically put back in place all the sanctions, controlled by Germany, Great Britain, France and the United States. Four to three, if that’s the way it turned out. The danger here is that if you move away, you put yourself into a stronger predicament than President Trump has created. Because with all of this focus on the Iran nuclear agreement, Iran isn’t going to trust anything that we do now on missiles or other things. They’ll all believe it’s trying to kill the deal. How does an Iranian leader compromise with the United States given the position they’ve been put in and the problem with the hardliners in Iran? This is untenable. It is not good diplomacy. It is not sensible strategy. We know what the world looks like without the Iran nuclear agreement. And it is not a better place. There is no sunset to this deal. There’s a sunset to a few provisions within it that Iran has to earn the right to be able to do by living up to the agreement. But there is a twenty-five year, cradle-to-grave tracking of all uranium mined and milled and used in Iran. There is a lifetime, for as long as Iran is a partner in this agreement, and lives by the NPT, and submits to the IAEA inspections, for the life of this agreement, you have Iran living by the enhanced Additional Protocol, which is the single most penetrating, intrusive inspection regime on the planet of any country that is using enrichment. So our intel communities – Russia, China, US, Germany, France, Britain – every one of those intel communities believe we will know what Iran is doing. And if, as Prime Minister Netanyahu legitimately worries, that they might go try to break out again, we will know it by virtue of the tick-up in enrichment. And if there’s no explanation, we have every single military option available to us in the future that we have today. There is nothing to prevent us and we should be dealing with of all those other issues with Iran. I have no question about that. But the problem is the waters have been muddied because of this credibility issue about America’s willingness to live up to any deal under the president. So how do you make an agreement on missiles? What Iranian leader, at this particular moment, is going to be in a position to compromise with United States or say the deal is going to be kept? This is the damage that has been done by this process. So if your real intent was in fact to have done missiles, or done human rights, or done weapons, or done Iraq – all of which we should do – we’ve lost the moral high ground and the capacity to be believed that that is really what we are trying to do.